Upon arrival into Auckland, transfer to your hotel and spend the remainder of the day exploring this exciting and beautiful harbour city. Leave Auckland today and venture north to the Waipoura Kauri Forest Reserve which is one of the most famous kauri forests in the country and the largest of its kind on the North Island. Take a short walk from the roadside to the base of a giant kauri tree called Tane Mahuta or ‘Lord of the Forest’. This is the largest tree of its kind known standing today. From here, continue on to the Bay of Islands and check into your hotel and enjoy a welcome dinner with your fellow travellers in the evening. 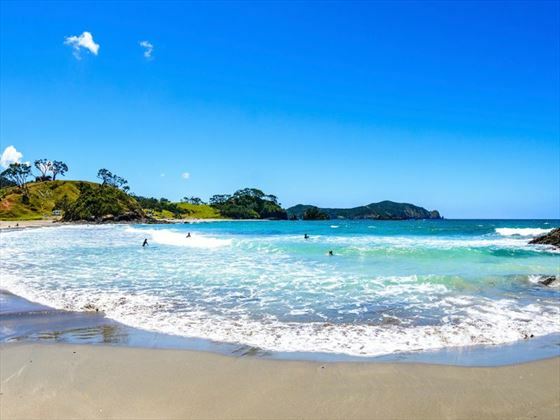 Spend a day at leisure in one of the most beautiful regions on the North Island – the Bay of Islands comprises 144 islands and is a tropical paradise of beautifully clear waters and secluded beaches. You could simply relax on the beach and admire the views, take to one of the many walking tracks or make your way into the town and dine at one of the local restaurants. Visit the finest maritime park in New Zealand today via a cruise to Cape Brett and the famous Hole in the Rock. 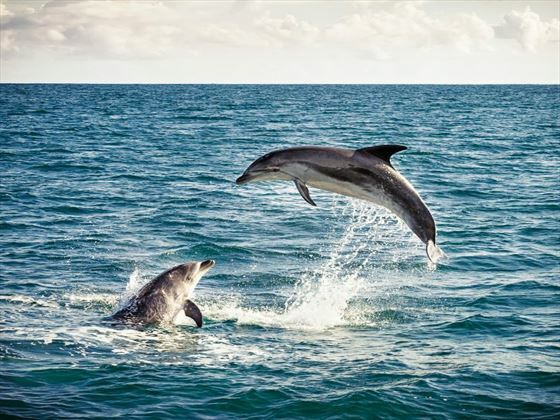 The coastline here is brimming with birds and marine life, from dolphins and seals to penguins and whales, so be sure to keep a lookout for these astonishing creatures. Afterwards, return to Auckland by coach. Leave Auckland after breakfast and travel to Waitomo which is famous for the glow worm caves, which you’ll have the opportunity to tour with a guide before continuing on to Rotorua. You’ll visit the cultural centre of Te Puia and embark on a guided tour of the Maori Arts and Crafts Institute. Afterwards, make your way to the Whakarewarewa Thermal Valley to see the natural spectacle of mud pools and erupting geysers. Later, at Te Puia, there will be the chance to dine on a traditional Hangi feast, followed by traditional performances of singing and dancing. 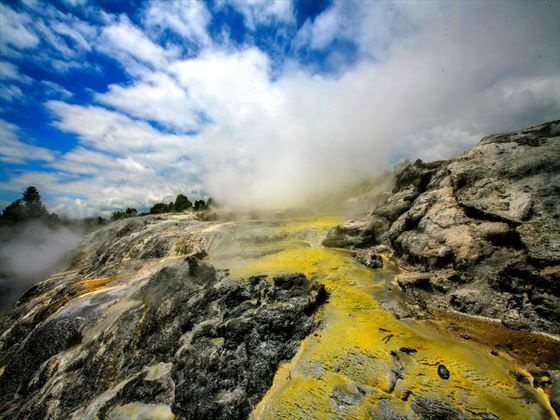 Rotorua is renowned for being one of the most interesting and culturally-rich destinations in New Zealand, with its geothermal wonders and fascinating Maori heritage. Situated over the most volcanically-active region in the world, it’s no surprise that the geothermal activity is a highlight of visits here. You will visit one of New Zealand’s best-loved attractions, the Agrodome. Here you’ll see sheep shearing demonstrations, dog trials and animal nurseries as well as learning about the practices of modern farming. Later on you can opt to take a helicopter flight above New Zealand’s only active White Island volcano (own expense). Leave Rotorua and travel along the Thermal Explorer Highway to visit Lake Taupo, the largest freshwater lake in Australasia, and Huka Falls. Afterwards, travel south across the volcanic plateau of the Tongariro National Park to Wellington. This evening explore the vibrant dining scene independently. 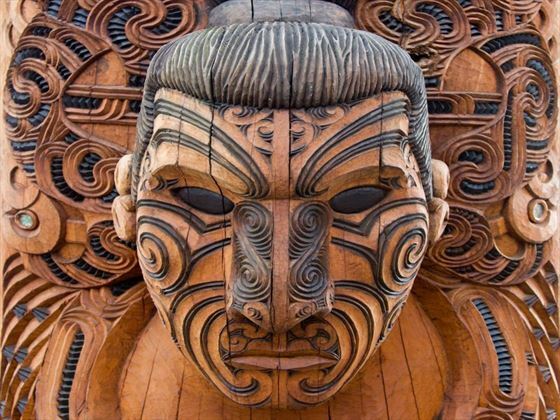 This morning enjoy a sightseeing tour of the city which includes the museum of Te Papa Tongarewa. After, take the Interislander Ferry across the Cook Strait this morning for one of the most scenic voyages in the world, marvelling at the beauty of the Marlborough and Queen Charlotte Sounds along the way to Blenheim. 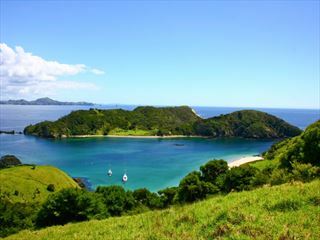 Travel to Kaikora and delight in the chance to embark on a whale watching cruise this morning. Hree is one of the few areas in the world where sperm whales can be sighted all year round, due to the deep Kaikoura Canyon. Later, arrive into Christchurch to settle in at your hotel before dinner. Take the coach to ascend into the Main Divide. 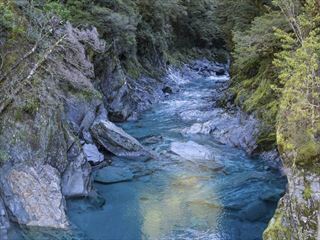 Sit back and enjoy the views through the Southern Alps to Westland Tai Poutini National Park. These natural wonders were formed over thousands of years and are as remarkable today as they were decades before. Journey across the Southern Alps today and through the awe-inspiring Haast Pass to the resort of Queenstown, on Lake Wakatipu. Spend the evening at leisure, admiring the views of your hotel which is backed by mountain scenery and looks out onto Lake Wakatipu before heading into the heart of Queenstown to dine at one of the many restaurants. Today is at leisure, where you have the freedom to choose whichever activity you like. 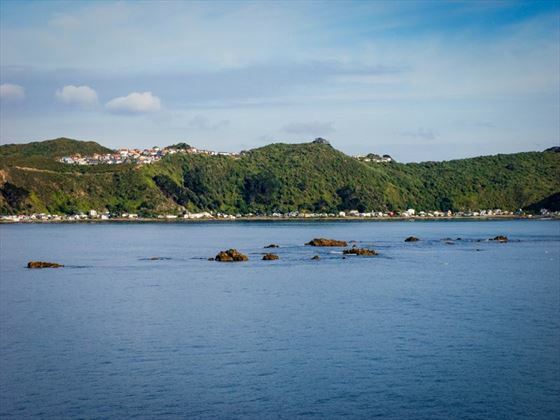 You may want to take a relaxing cruise on the oldest steamship in New Zealand, the TSS Earnshaw, or take a gondola ride to the top of Bob’s Peak for amazing panoramic views of the scenery below (both additional cost). If you’re looking to explore the culinary side to Queenstown, why not visit the Central Otago region independently? This area is one of the country’s leading wine-producing areas. 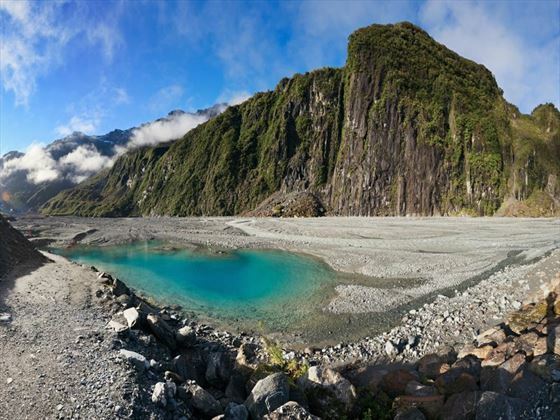 Follow the Remarkables mountain range to Fiordland National Park, then journey along the Milford Road which is largely considered to be one of the best alpine drives in the world. 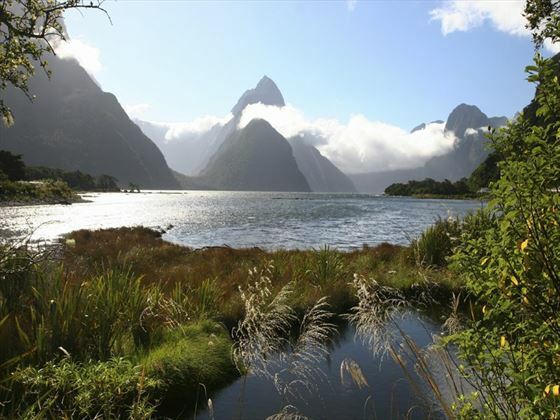 Upon arrival at Milford Sound, take part in a cruise to see the astonishing scenery of cascading waterfalls, rainforests and mountains first-hand. 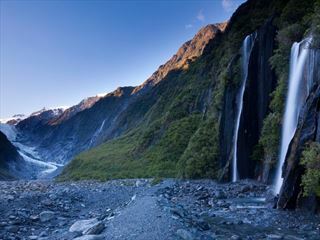 Depart from the Fiordland region and journey through the Southland countryside to arrive in Dunedin. Take part in a city tour to take in the significant landmarks and sights before heading to Larnach Castle – the only castle in the country. There will be some time at leisure before you return to have dinner with your group. Traverse the east coast to visit the Moeraki Boulders – large, spherical stones which were formed over 60 million years ago. Make your way to Oamaru to witness some 19th century architecture then journey into Mt Cook National Park later on to witness the highest mountain in Australasia – Mt Cook or Aoraki. 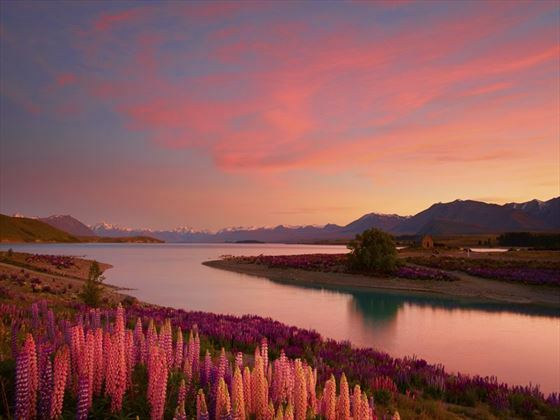 Your hotel is located on the shores of Lake Tekapo and is the location of your delicious farewell dinner this evening. Visit the Church of the Good Shepherd today before your tour concludes at Christchurch Airport.